This week the Trump administration released its budget proposal for FY20, and once again, it proposes shutting down the National Endowment for the Arts. 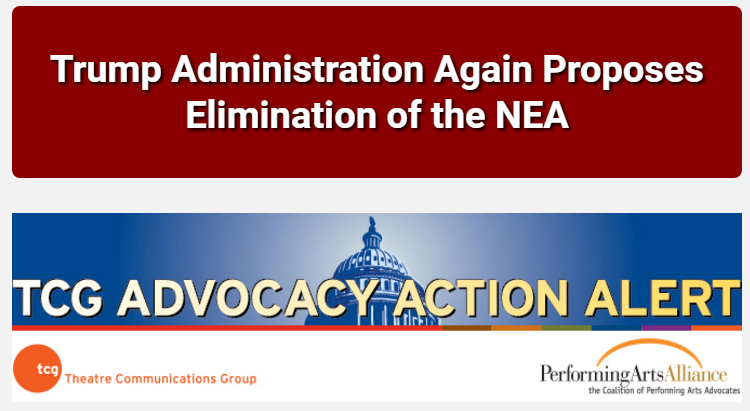 The proposal states that the administration "does not consider NEA activities to be core Federal responsibilities." This is the third year in a row that the administration has proposed eliminating the cultural agencies. It's also the third year in a row that a bipartisan Congress has demonstrated its support for the agencies by increasing their budgets. The recently passed federal budget gave each the NEA and the NEH a $2 million increase for FY19, bringing the funding of both to $155 million. Eliminating several programs at the U.S. Department of Education such as the Arts in Education program, Student Support and Academic Enrichment Grants, and 21st Century Community Learning Centers. TCG recently served as a National Partner for Arts Advocacy Day, when more than 500 advocates visited Washington, D.C. and many of you sent e-mails on March 5 urging Congress to fund the NEA at $167.5 million for FY2020.